When they’re brand new and professionally lit in a showroom, pretty much all kitchen cabinets look handsome, even the bad ones. That’s not an optical illusion; it’s a façade. And it’s one that can get shoppers into trouble, leading them to mistake good looks for good quality. But most of us know, at least by the time we’re old enough to be buying kitchen cabinets, that all that glitters is not gold! Front pieces should be solid wood and relatively free of imperfections—no sanding marks, knots, or color or grain irregularities, etc. Drawer fronts and cabinet panels should be made from solid wood. Drawer sides should be made from hardwood that is more than a half-inch thick. Side and floor panels inside the cabinet should be least a half-inch thick. Side panels should be routed with a groove to support the drawer base. Floor inside the cabinet should be fitted into the routed side panel. Shelves inside the cabinet should be least three-quarters of an inch thick. Hinges should be adjustable to align with the face frame. Door panels should not be glued or fastened into their frames. They should be fitted into deep, lightly padded grooves routed into the frames. That way, their natural response to humidity changes over time—expansion and contraction—won’t cause cracking or warping. Each drawer should be supported by two side-mounted slides rather than a single slide. Shelves should be adjustable and supported by metal—rather than plastic—brackets. Bottom line, the worth of kitchen cabinets makes itself known over years of use. But if you know what to look for in cabinet construction, you won’t need to wait all that time to find out if you chose wisely. 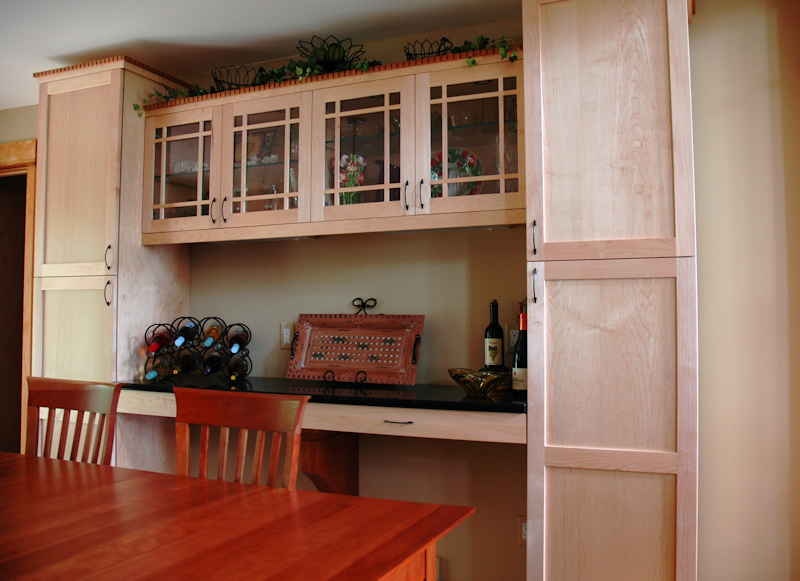 Brunsell’s custom cabinets are built by true artisans in our mill. We work with clients to come up with designs that fit their budget and style, giving them as much unique as they want. Because we use time-tested craftsmanship and pour or hearts into our kitchen cabinets, their good looks don’t fade, and they stand up to whatever you dish out. Come take a walk through our showroom to see what high quality craftsmanship looks like, and maybe find the right cabinets for your home! This entry was posted in Custom Cabinetry, Lumber and tagged Brunsell Lumber, Cabinetry, custom cabinetry, Custom Cabinets Madison, Custom Millwork, Millwork Madison. Bookmark the permalink.